DSTRYRsg: Destroyer Submission Grappling and Brazilian Jiu Jitsu: BEST OF DSTRYR/SG: BJJ - IT'S WHATEVER YOU WANT IT TO BE. BEST OF DSTRYR/SG: BJJ - IT'S WHATEVER YOU WANT IT TO BE. "BJJ: It’s Whatever You Want It to Be"
A great thing about our sport is we can mold it into whatever we need from it. BJJ is always there for us, just waiting for us to insert it into our lives however we see fit. Let me show you how BJJ has been different things at different times in my own life. Before I started training BJJ in ’95, I was an aspiring mountain bike racer. I would spend 12-15 hours a week training on a bicycle. I followed a rigid diet, tracked my heart rate, shaved my legs, and spent thousands of dollars on bikes and equipment. About the time I figured out that I didn’t have the physical attributes to be a professional racer, I found BJJ and never looked back. As a single guy in his mid twenties, BJJ provided me with a way to channel my testosterone and fill my need for competition. Also, in the 90s, jiu jitsu had a ‘cool factor’ to it. It was not at all popular, but everyone knew who Royce Gracie was and I proudly wore my Gracie Academy t-shirt wherever I went. As my life evolved, the role of BJJ in my life evolved as well. As I became a proficient purple belt, my need to advertise myself as a tough guy diminished. I guess it’s the difference between false confidence and true confidence. BJJ was now as integrated in my life as eating or sleeping. BJJ also provided me with a social network of cool guys that were as passionate for the sport as I was. Something about this sport weeds out the assholes (good topic for another article). As I near mid-life, BJJ is a way to escape and assuage the daily stresses of life. When I’m on the mat, my mind is focused on BJJ, and only BJJ. Training 3 to 4 days a week keeps my inner fatboy from taking over. God knows, you’ll never see me running on a treadmill at 24 Hour Fitness. Now that I’m an instructor, I get great satisfaction from helping my students progress through the ranks. To have a hand in helping newbies go from their first day to getting their blue belt is quite rewarding. So make BJJ is whatever you need it to be for you. Are you getting sand kicked in your face? Want to get in/stay in shape? Don’t have any friends? Wanna be the next GSP? Stressed at work? Jiu Jitsu is there, waiting for you. 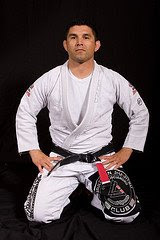 * Kenny is a Street Sports (Renato Magno) 2nd Degree Black Belt and one of the chief instructors at Simi Valley Jiu Jitsu. It is no exaggeration when I say that BJJ saved my career, my marriage and maybe even my life. Anything done with passion and commitment can act as a positive force in our lives. Luckily for me, I found BJJ just in time.